Though he now lives in Durham, Mark Hellman grew up in a very small town in Indiana. His first home was across the street from the township's only polling place, the St. Mark's Episcopal parish hall. “What I saw through our front windows was a lot of people staying around after voting to socialize a bit,” he says. “It seemed like a good thing.” His first extensive canvassing was in Chicago, often for candidates not supported by “the Daley machine,” such as George McGovern in 1972. “I admired some things about the machine, such as the starter jobs they provided to some low-income youth, but it wasn't reliably progressive, to say the least,” Mark says. 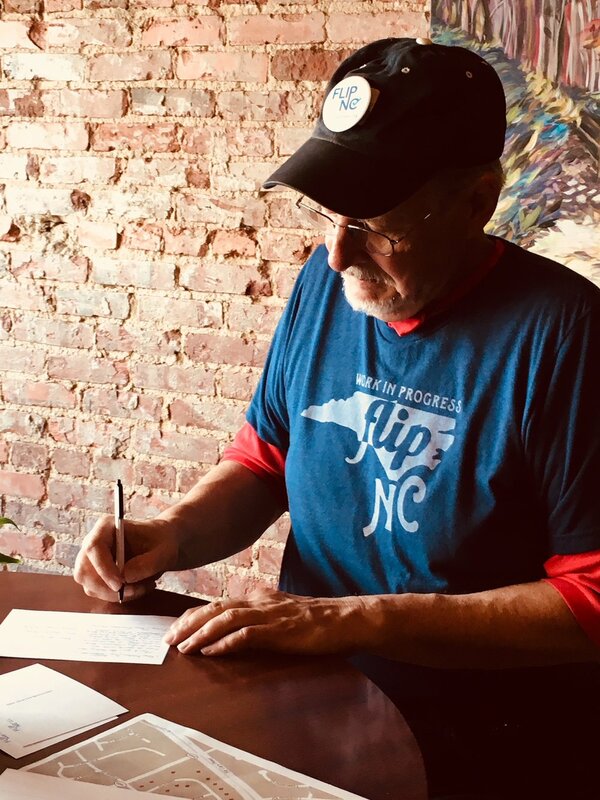 Mark is retired from NCDOT, where his job before moving into management was meeting with property owners to acquire the right of way for new road projects – everything from paving dirt country roads to building I-540. Here, a Q&A with Mark. How many people aren't home on a Sunday afternoon in this suburban House District. But I’m equally surprised and delighted by the willingness of almost everyone who is home to take a few minutes to talk. Sometimes you have to give them a break and mark them as essentially NH (not home) because they've told you they're just getting back from a trip to France or they're late picking up their teenager from the pool. But overall, you have enough conversations on a given canvass and find a few of those key people who are raring to vote, and probably to volunteer, to make it well worthwhile. Neither! Actually, I only slightly prefer to work alone and have had both good "strangers" and old friends as partners. The pizza that we eat after canvassing. I like the all-veggie pizza! And the casual debrief time after canvassing with the ability then to send postcards to the most interested folks you met. Those are good features. I've wondered myself and count nine times in my Google Calendar going back to last summer, when we launched from a Carolina Ale House in Cary. The food there was pretty good, too. Maybe an Indivisible house meeting in my neighborhood in March 2017 or word-of-mouth at the annual precinct meeting of a certain party just before that. Not really a story, but I remember clearly a family from the Netherlands and the sense of their bewilderment at Trump and the turn their new country had taken. I make it clear right away that I'm a volunteer and not asking for money, just a few minutes of time and "your view of things, particularly issues of concern at the state level." Something like that seems to ease people up pretty quickly, especially the "not asking for money" part. I want to say what many voters we canvass say: "Everything!" But I'd narrow it down to the bad fiscal policy of cutting taxes mostly for prosperous people and companies and then underfunding just about everything that helps create a good society. I'm optimistic about solid gains, enough to make the currently veto-proof Republican majority negotiate with the governor and bring some balance to the state. Older Post8 Reasons Why Canvassing Can Make a Huge Difference in the Midterms (& Beyond)!